Have you ever heard personal trainers or fitness pros talking about how to use something called Threshold Intervals? That’s because there are typically two schools of thought when it comes to cardio. 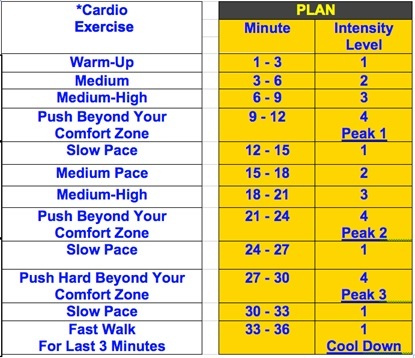 Traditional steady state cardio OR short, hard intervals. Of course, BOTH of these strategies work. this often overlooked anaerobic system. “Threshold” intervals are hard bursts of intense exercise that last at LEAST 60 seconds all the way up to 2 or 3 minutes at a time. There are some VERY powerful benefits to working this system. In fact, solid research shows that the longer, 2 to 3 minute intervals have the ability to deplete glycogen MUCH faster than steady state cardio or even short, hard metabolic bursts. This is especially important, RIGHT NOW, after the weekend. It will help you UNDO the damage of a weekend binge by burning off all that extra carb storage you have going on inside your liver and muscles. First, this approach conditions the first anaerobic system (i.e. anaerobic glycolysis) to prime the metabolism for sustained weight loss and results from other intensity levels. Test subjects who regularly performed threshold type intervals also burned MORE fat when they performed steady state or higher intensity intervals. So it primes and programs your metabolism to get a faster and better fat burning “response” when using other intensity levels. In other words, the Threshold system “feeds” OTHER intensity levels to prevent plateaus. Below is an advanced routine you can try. You’ll notice I broke it down into 3 different “peaks”, so if you’re a beginner or you’re in a hurry you can adjust the time to be 12, 24, or 36 minutes. IMPORTANT: Make sure to pace yourself so that you can maintain close to the SAME intensity level for the ENTIRE 3 minute blocks. This is what’s going to create the desired “Threshold” effect to achieve all the benefits I listed above. Keep in mind this is the most important aspect of this approach. Sometimes it’s difficult to gauge intensity with Threshold Intervals because the intervals are longer in duration. If you go “all out” at the beginning of each interval, you’ll poop out and never make it all the way through while maintaining the proper intensity. You’ll also be tapping into and working the WRONG system. So there you have it. The BEST way to deplete glycogen after a weekend bender and put the brakes on fat-storage. Of course, you can still use high volume weight training with large muscles groups (and short rest periods) to get a similar “depleting” effect too. Just make sure you’re combining threshold intervals with resistance training and other high intensity exercise to keep your body responding. With summer being right around the corner, Karen and I always dive into proven bodyweight circuits. It gives us something to fall back on when we’re traveling, in a hurry, or don’t have time to get to the gym when “life happens”.